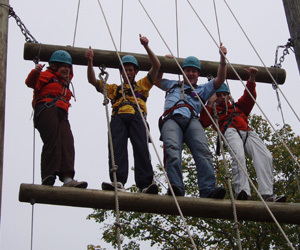 We offer scenario-based activity programmes that are tailored to your needs. We can work towards specific outcomes identified by you, whether it be team-building, fun, communication, or promoting a confident approach to challenges. We have found that by interweaving a number of activities into a wider scheme, we can get everyone really involved. Sometimes people cannot see the point of challenging themselves, but hopefully a scenario provides a bigger 'carrot' - and a justification for completing each activity. We have successfully delivered days like this in the past for everything from a small group of teenagers, through to 70 first-year university students, who spent three days abseiling, climbing Jacob's Ladder, exploring caves and working as a team, all in order to find out the true identity of VIM from Alpha 23.
Who is VIM? What is Alpha 23? Click the video on the right to find out nothing more! These scenario-based days can then be reviewed, and learning outcomes applied back in real life, whether that be home, school, university or the workplace. We aim to be creative and accommodating when it comes to the design of any scenario, and take into account any goals/outcomes you wish to achieve. This is then delivered by an enthusiastic team of instructors who are only too happy to ensure a good-humoured and professional programme.